It was 1936, the height of the Depression, and the nation was looking for distractions. Often the youthful and innocent provided them. Shirley Temple was a hit in the movies, Little Orphan Annie was the star of comics and radio. And in Ridgefield lived three children who also won the hearts of many Americans. 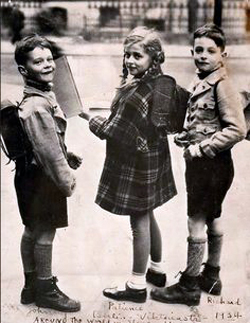 From left to right, John, Patience and Richard Abbe. Indeed, the three Abbes were offspring of James E. Abbe, one of the top photographers of the era, and with their parents, they had spent most of their lives in Europe. They played with Pavlova and Hemingway, loved Lillian Gish, and admired Thomas Mann — all of whom they met along with many other celebrities of the era. Hollywood wooed them for movies and politicians brought Patience to Capitol Hill, where she gave a dinner party — preparing her own food! A year later, they were gone — moving to a 320-acre ranch in Castle Rock, Colo., purchased with the profits from the book, which sold a then-remarkable 100,000 copies. The three — mostly Patience, who essentially wrote the first book — penned two more volumes: “Of All Places” (1937) and “No Place Like Home” (1940). Patience went on to work in journalism and lived in California, where she died in 2012. Richard eventually became a noted California judge; he died in 2000. John lived in California, too, and died the same year as Patience. Their dad, James Abbe, is still recognized today as a pioneer photojournalist, and many of his works are owned by major museums. Though he was born in 1883, he was from Connecticut stock – many Abbes lived in Enfield. He grew up in Virginia and worked for newspapers and magazines, photographing many of the stars and political leaders of New York, Paris, London, Berlin, Madrid, and Moscow in the 20s and 30s. His portraits of Charlie Chaplin, Tyrone Power, Gloria Swanson, Cecil B. De Mille, and others were famous. But he went on to cover breaking news, recording the Spanish Civil War, the Nazis rise to power, and events in the Soviet Union — his 1932 portrait of Joseph Stalin was used to stop rumors that the dictator was dead. By the 1940s, Mr. Abbe had become a radio broadcaster in the West and in 1950, was one of the nation's first television columnists, writing for The Oakland Tribune until 1962 when he retired at 80. He was the author of I Photograph Russia (1934). Stars of the Twenties, a collection of his work, was posthumously published in 1975. Mr. Abbe died in 1973 in San Francisco.